Blog de trabajo de la Asignatura de Ciencias Sociales para 1º y 2ºde ESO, en el IES Los Sauces de Benavente, Zamora. España. Este blog queda concluido aquí hasta que tenga que desarrollar en algún momento 2º de la ESo, pero mientras que me centre sólo en 1º de la ESO la tarea vamos a desarrollarla en Bilingue Sauces 1º ESO, solo la materia de los alumnos con la asignatura de pendientes continuará aquí. 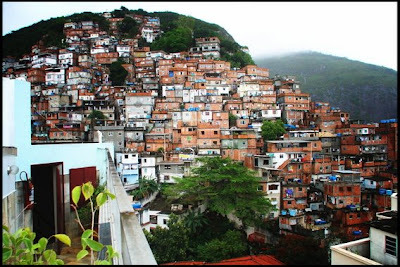 Shanty towns (also called squatter settlements camps, favelas or Georgie Slums) are settlements (sometimes illegal or unauthorized) of impoverished people who live in improvised dwellings made from scrap plywood, corrugated metal, and sheets of plastic. 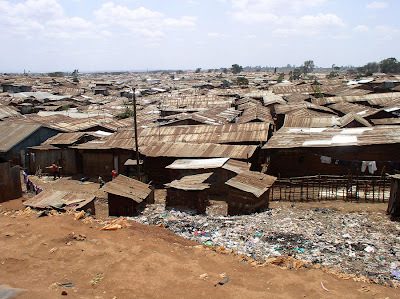 Shanty towns are mostly found in developing nations, or partially developed nations with an unequal distribution of wealth (or, on occasion, developed countries in a severe recession). 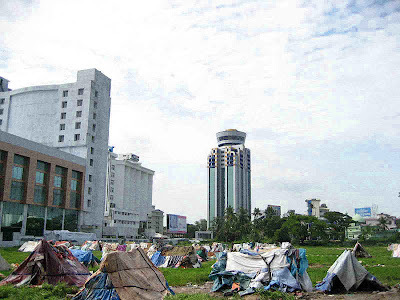 In extreme cases, shanty towns have populations approaching that of a city. The first recorded use of the word shanty, as meaning a crude dwelling. There is a near total absence of formal street grids, numbered streets, sanitation networks, electricity and telephones. 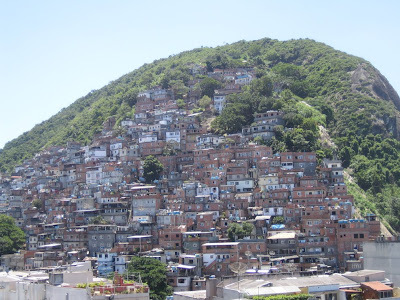 Shanty towns also tend to lack basic services present in more formally organized settlements, including policing, medical services, and fire fighting. Fires are a particular danger for shanty towns because of the close proximity of buildings and flammability of materials used in construction. 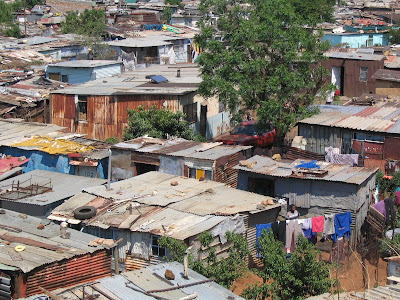 Stereotypes present shanty towns as inevitably having high rates of crime, suicide, drug use, and disease. However the observer Georg Gerster has noted (with specific reference to the invasões of Brasilia), "squatter settlements [as opposed to slums], despite their unattractive building materials, may also be places of hope, scenes of a counter-culture, with an encouraging potential for change and a strong upward impetus." The largest shanty town in the world is the Neza-Chalco-Itza barrio in Mexico. The largest shanty town in Asia is the Orangi Township in Karachi, Pakistan. while the largest in Africa is Kibera in Nairobi, Kenya. 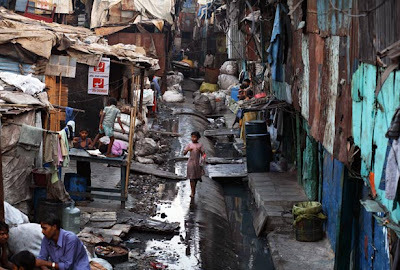 Another large shanty town is Dharavi in Mumbai, India which houses over 1 million people. Throughout history, most human beings have lived in rural areas. But urbanization was rapid throughout the 20th Century. This article is part of the Inspiring Cities open source campaign Help Us Write the 2008 UNFPA Culture Paragraph. By 2007, city dwellers will outnumber those in rural areas for the first time in history.In 1800, only 3 per cent of people lived in cities. London, with about a million habitants, was the largest city in the world. By 1950, the world was urbanizing rapidly, 8 cities had populations of 5 million or more. Two were in the developing world. By 2000, 30 more cities had 5 million people or more. Most were in the developing world. 47 per cent of the world’s people lived in urban areas. By 2015, another 17 cities will have grown to 5 million or more. 23 will be “mega-cities” with 10 million people or more. Most will be in the developing world. By 2030, 20 cities are projected to have 20 million people or more. Based on current trends, 1.5 billion people will live in slums. Metropolis by Rob Carter - Last 3 minutes from Rob Carter on Vimeo. Charlotte is one of the fastest growing cities in the country, primarily due to the continuing influx of the banking community, resulting in an unusually fast architectural and population expansion that shows no sign of faltering despite the current economic climate. However, this new downtown Metropolis is therefore subject to the whim of the market and the interest of the giant corporations that choose to do business there. 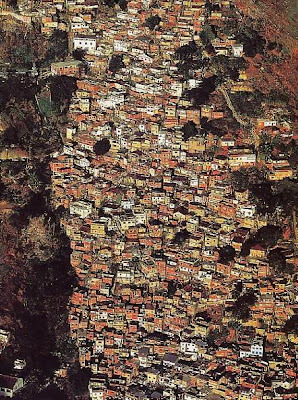 Made entirely from images printed on paper, the animation literally represents this sped up urban planners dream, but suggests the frailty of that dream, however concrete it may feel on the ground today. Ultimately the video continues the city development into an imagined hubristic future, of more and more skyscrapers and sports arenas and into a bleak environmental future. It is an extreme representation of the already serious water shortages that face many expanding American cities today; but this is less a warning, as much as a statement of our paper thin significance no matter how many monuments of steel, glass and concrete we build. What kind of City layout are there?, Only one? 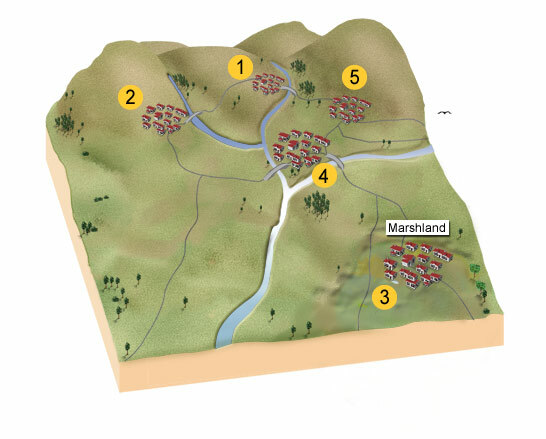 The site of a settlement is the land on which it is built. There are a number of different types of sites which have been used for settlements from earliest times. Identify the type of site by matching each settlement letter to the appropriate description of its site. The importance of individual site features changes through time. Faster communication As industry grew and developed e.g. canals, railways and more recently, motorways and airports. Procomún, Red de Recursos Educativos en Abierto. Este blog surge como herramienta de trabajo para la C. Sociales en el IES los Sauces. Pretendemos convertirlo en un archivo vivo de todo el trabajo que vamos a desarrollar en el aula, en la nueva experiencia en la que nos aventuramos. Pretendo con la misma iniciar un camino, tanto en lo personal como en la nueva etapa que comienzan aquí cada uno de mis alumnos. Este blog es un espacio exclusivamente educativo, en las imágenes, textos empleados o cualquier otro elemento puede que a veces no se indique su autor, por error u omisión. Si alguien considera que sus derechos sobre las mismas se ven lesionados, puede ponerse en contacto con nosotros que corregiremos de buen gusto nuestro error, lamentando las molestias. Muchas gracias.